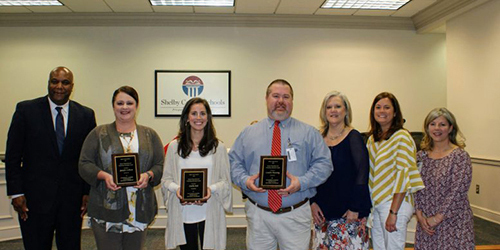 The Shelby County Owens-Young Memorial Technology Innovation Award is an annual award which spotlights teachers who are exemplary technology integrators and leaders. The Owens-Young Award honors two former Shelby County School's technology employees whose work paved the way for teachers to integrate technology into their classrooms. The first is Denise Owens. Mrs. Owens taught in Shelby County Schools for 22 years and became one of the District's first Technology Resource Teachers in 1998. Her work helped hundreds of teachers design innovative lesson plans using a wide range of technology. Mrs. Owens retired in 2000 and passed away in 2007. The second is Michael Young. Mr. Young was a computer programmer who came to work for Shelby County Schools in 2007 as a network technician. He, too, made an impact in the classroom by ensuring that the technology and network connections in classrooms were working well so that students and teachers could take advantage of all technology has to offer. He enjoyed working with the teachers and students. He passed away in 2013. This year's winners were nominated by their schools. Each will receive $1,000 in technology for their classroom. Landon Manning, Vincent Middle High School. Jackie Plaia - Oak Mountain High School. Site Map | Website by Shelby County Schools. All Rights Reserved.